I like James Bond, sometimes. I get into moods where 007 movies scratch a particular kind of itch. I even like Quantum of Solace, and that's saying something, because the film didn't even have a finished script due to SAG strike. Is there a sadder story than Daniel Craig's tenure as Bond? We start with the absolutely great Casino Royale, we got the very good Skyfall, but then we last ended on Spectre? Daniel Craig deserved better. But did you know he was basically in Goldeneye as well? The classic N64 Goldeneye was remade by Activision and Eurocom for the Wii, and later for the PS3 and Xbox 360. 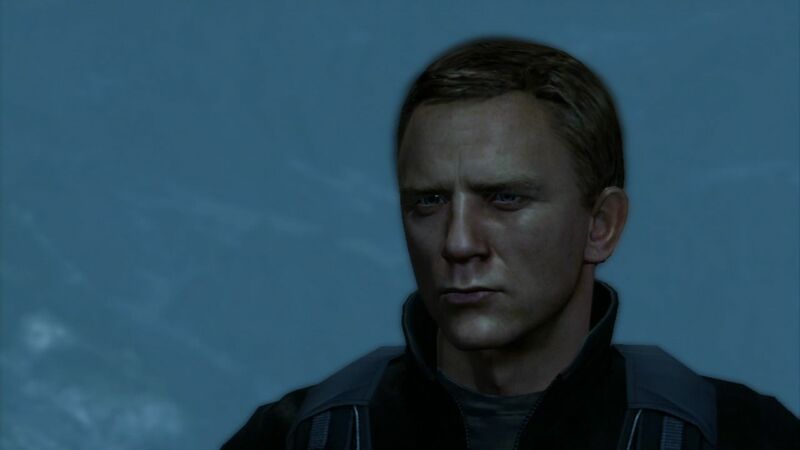 It stars Daniel Craig in an updated, video game form of Goldeneye. Think the original Goldeneye, give 007 some regenerating health, Call of Duty set piece, and a modern aesthetic, and you have this game in a nutshell. It's easy to be cynical about the tunnel-like gameplay. Maybe too easy... But the game really tries to vary up the locations, the weapons, and the objectives. And it's all done in this slick modern style. What didn't age well were the quick time events, which look janky and stilted most times. Quite possible the greatest "feature" of this game is the aim assist. Video games on consoles use aim assist because controllers are difficult to use accurately. So the player takes the camera 90% in the direction of a target, and the aim assist snaps the remaining 10%. Easy, right? Outside of Syndicate from EA, this is one of the most aggressive forms of aim assist I've ever seen. Simply aim in the general direction of an enemy, whether close or far, and 007 will immediately lock on to them. Gunfights turn to hide behind cover, immediately aim down sights, fire a few shots, let go, rinse, repeat. It's great! Now I need to preface this next part. I played on 007 mode, which is basically hard mode, but not the hardest mode. That is reserved for 007 Classic, which doesn't use regenerating health. Let this be known. For the vast majority of the game, I enjoyed it. Levels were fun, varied, explosive. It was very Call of Duty-fied, but it was a good romp. The last two hours we're not. I'm not sure if these sections were even properly play tested, because they were so broken and annoying I couldn't understand how someone gave this the okay. The majority of this frustration was with the load times. I've never complained about load times, not even since the PlayStation 1. Load times have never bothered me. But here it is indefensible. Here's the essence of the many encounters. Clear a checkpoint, next wave of enemies appear, and generally instant death. Takes about 10 seconds. Now a 35 second load time appears. Restart. Try and figure out how to handle this wave of enemies. Takes about 10 seconds, then death. Now 35 second load time appears. Levels can be finished in 15 minute chunks, so spending 5 minutes on a 30 second section makes someone want to bash their head against a wall. This is about the last two hours of the game. Now imagine a cover shooter the gives 007 no working cover, hordes of enemies from literally every angle, and a time limit. That's the last level of the game. To get to the final boss, I somehow glitched through a door an enemy was running out of. This building was the correct one to enter, but generally there is an invisible wall to stop this entrance from being accessible. Except when that enemy has to run through. That's the only way I managed to beat the game, because there were so many enemies on the other side of the building that going there was certain death. Goldeneye 007: Reloaded is kind of enjoyable. Seeing Daniel Craig in Pierce Brosnan's place is worth the novelty alone. I don't know if the game is worth remembering, but its heart was in the right place. Except those two hours. I'm glad I've gotten rid of it because of that. Thank you for stopping by. You can help support content like this easily by checking out some of my books, subscribing to the newsletter, or following on social media that's most convenient for you.